Mitt Romney kicked things off, and Bill Clinton gave him a glowing introduction, lauding his work on behalf of City Year. Romney thanked him, saying, "If there's one thing we've learned in this election season, it's that a few words from Bill Clinton can do a man a lot of good." The crowd chuckled appreciably. Romney's speech focused on fostering private enterprises overseas. Foreign aid "can't sustain an economy. 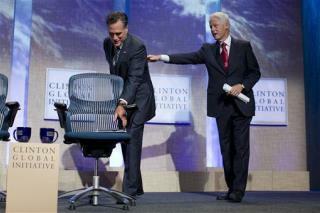 It can't pull the whole cart," Romney said. He said that successful states were those that are most economically free. He also promised to renegotiate America's trade agreements, and said he'd expand the trans-Pacific partnership and create a "Reagan Economic Zone" made up of "any nation willing to play by the rules of free and fair trade." He summed up his approach thusly: "We're going to pair aid with trade." He also took a not-so-veiled swipe at Iran, referring to "a voice of unspeakable evil and hatred" threatening Israel. "I'll never apologize for America," he added. Obama too praised Clinton, calling him a "great treasure," and again joking that he should be the "secretary of explaining things." He also thanked Clinton for understanding "record-breaking number of countries visited by our secretary of state." Obama's speech focused more or less entirely on the "injustice, the outrage, of human trafficking, which must be called by its true name of modern slavery." He urged Congress to renew the Trafficking Victims Protection Act—which he dubbed a "no-brainer"—said that multi-national corporations must ensure their supply lines "are free of forced labor," and urged the world to both directly combat slavery, and address its underlying causes. "Nations must speak with one voice: our people and our children are not for sale." Regardless of your politics, Clinton is one of the real brain trusts of the planet. He is a wonk without being a wonk and that means he knows what needs to be done and how to get it done. My hat is off to the man. Clinton should moderate a debate. Or at least sit next to all the moderators of the coming debates. The man has an effect on discourse! I was surprised that Romney could get through an event without sticking his foot in his mouth and Obama actually toned down the platitudes. I see the chair got a facelift...is that a "Mesh" backing?! how swank!